THE REVOLUTION IS BEING TWEETED! Rosemary A Ajayi has been directly involved with the monitoring of social media during Nigeria’s elections. She sent this report last evening. Nigeria’s 2011 general elections are high up on the list of my ‘most anticipated events’. For the first time in Nigeria’s history, twenty- and thirty-something year old Nigerians across the world have been granted an opportunity to take active roles in the conduct, reporting, monitoring, scrutinising and documentation of the elections. I am one of many who have been afforded the chance to be more than just a voter in these elections; I am actively involved in EiE Nigeria, a project to mobilise and empower young Nigerians to participate positively in the upcoming elections. I am also involved in a study which tracks and analyses the impact of social media on the Nigerian elections. The Social Media Tracking Centre is supported by EiE Nigeria , the International Republican Institute, the International Foundation for Electoral Systems and the Shehu Musa Yar’Adua Foundation. Despite recording only 44 million Nigerians (out of an estimated 150 million) as having access to the internet, it is impossible to imagine elections in Nigeria without tools such as Facebook, Twitter, SMS, mobile phones, mobile apps or cameras. These have fast become the weapons of choice for the Nigerian revolution. On the eve of the parliamentary elections, US-based Nigerian and international observer, MsChika411 received local reports of misconduct in Owerri, Imo State and published them on twitter. She received over 200 retweets and mentions, including abuse and praise. This led to the deployment of CSOs to the area to investigate. A national newspaper also tailed, Kema Chikwe, the alleged offender. Reports from these additional sources supported MsChika411’s claims. The Independent National Electoral Commission, INEC, made up for its absence from Facebook and Twitter during the voter registration and verification stages by recruiting 4 social media interns. 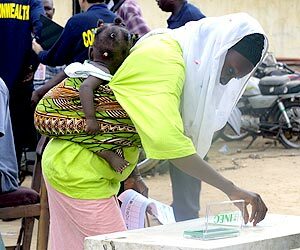 On the afternoon of April 9, when I relayed questions from twitterers to IFES asking if voters could tweet results from their polling units, I would never have imagined that within hours INEC would be asking Nigerians to tweets results as well as photographs of the result sheets. Ordinary citizens like Ibrahim Lawal were empowered by INEC’s directive to remain behind and send in photographs of results. Prof Dora Akunyili, the past Minister for Information & Communication, used her Facebook and Twitter (no longer available) accounts to announce her victory over her rival in the Anambra Central senatorial district, Chris Ngige. INEC would later announce Dr Ngige as the winner. The following video was filmed using a mobile phone at a polling station in Rivers State. Despite being marred by logistical challenges, bomb blasts killing at least 13 election personnel, violence, ballot snatching, bribes, Nigerians generally feel that the process so far has been fairly transparent, whether this translates into credible elections, only time will tell. There is one thing that is certain – Nigerians are watching!